C: Marián Bielik (Fajolo), Jana Beláková (Bela), Eliska Nosálová (Stana Blazejová), Andrej Vandlík (father, Ján "Jano" Blažej), Olga Salagová (Jana), Pavol Chrobák (mechanizátor Blažej), Adam Janco (Stohár Blazer), Lubo Roman (Peto), Anton Galba (Meg), Vladimir Malina (fisherman). The film was not theatrically released in Finland. For the first time in Finland we screened Štefan Uher's The Sun in the Net, a pioneering Slovakian New Wave film. Věra Chytilová's O něčem jiném / Something Different, the first Czech New Wave film, had its premiere nine months later, on 20 December 1963. We hereby launched our tribute to the Slovakian New Wave in collaboration with Slovenský filmový ústav (SFU), inspired by the retrospective three years ago at Midnight Sun Film Festival curated by Olaf Möller. In it we are also screening Peter Solan's Before This Night Is Over (Kým sa skoncí táto noc, 1966), Eduard Grečner's Return of the Dragon (Drak sa vracia, 1967), Dušan Hanák's Pictures of the Old World (Obrazy starého sveta, 1972), and Elo Havetta's Wild Lilies (Ľalie poľné, 1972). Štefan Uher works here with his trusted screenwriter Alfonz Bednár, cinematographer Stanislav Szomolányi, and composer Ilja Zeljenka. There is an awareness of contemporary international new wave approaches: a documentary impulse, an appetite for reality, a curiosity for the life lived today, a sensitivity to the immediate experience. Heavy structures are avoided. Totalitarian political control is ignored, and an atmosphere of freedom prevails in observations. The fabric of life is honest and complex, not conforming to moral lessons or models. Sequences of the work brigade at the farm reveal a failure of the planned economy. The film takes place in the city of Bratislava, on the banks of the Danube, and in the countryside in Meleňany. At the center is the Blažej family drama. Via the 15-year-old daughter Bela we learn to know her blind mother Stanka and her negligent father Jan. Bela's boyfriend Fajolo travels to a farm as a member of a summer work brigade. In Fajolo's absence Bela starts to date another guy, Peto, while Fajolo is seeing Jana, the only girl in the work brigade. At the farm in Meleňany lives also Bela's grandfather, Stanka's father, who lets Fajolo into family secrets. Follows a crucial encounter in Bratislava at the family dinner table. The children take their blind mother Stanka to an outing into the woods and towards the Danube. The water level has sunk, and the pontoon they are visiting is on dry ground, but they lie to their mother about the scenery. A key event is an eclipse, one like has not been seen in 120 years. There had actually been such an eclipse on 15 February 1961 which perhaps also inspired Michelangelo Antonioni's L'eclisse (1962). Another film which somehow come to my mind watching The Sun in the Net was Ingmar Bergman's Through a Glass Darkly (Såsom i en spegel, 1961). Glasses are being smoked. Lectures on the sun are being heard. Ancient sun myths are evoked, such as the sol invictus of Ancient Rome. The title of the film refers to an image of the fisherman's net at a moment when the sun is reflected in the Danube, "caught in the net". The fisherman's pontoon at the Danube is a central location. The old fisherman is an invalid with a hook prosthesis in one arm, and sometimes he uses his net to cool a bottle of alcohol. He is "old in years, young for love", with a loving wife. The farm at Meleňany is another key location. The work brigade's tasks are hampered by rusty machines beyond repair and bureaucratic restrictions about the use of the wood. Instead, Fajolo gets to date Jana, and learn to know the fascinating old-timer Blažej, a driving force at the farm regardless his age and the mindless administration of the collective system. Štefan Uher identifies with the young, shows a lot of respect for the old generation, and reveals a suspicious attitude towards the middle-aged. All generations are displayed: the film starts with images of eggs of a waterbird by the Danube and children's play at the courtyard (rolling inside a tyre), and it ends with a child's request "bread, mother". The music is based on a spare avantgardistic concept by Ilja Zeljenka. Ocarina solos are a specialty. A major role is played by a ubiquitous stream of what is known in Finland as rautalanka [literally: "iron wire"], a reduced early 1960s instrumental style rock such as in "Apache" by The Shadows. Transistor radios are everywhere, and they are playing a banal variant of this music. For Fajolo it is a revelation to travel into the countryside to experience silence. There grandfather Blažej even teaches him how to silence a public loudspeaker. Also Stanka tells how she loves silence, "as if I had been preparing myself to this silence forever". There is a poetic structure in the imagery and the soundscape. The film is rich in density, but not without a few longueurs. At times exquisite compositions seem to cover missing depth. But as a whole The Sun in the Net is a very engaging achievement, and it is likely to gain from revisiting. A very good visual quality in the SFU print, a couple of minutes longer than the official duration. Ilmestyessään Tsekkoslovakiassa helmikuussa 1962 Aurinko verkossa joutui hallinnon syyniin. Sen katsottiin olevan kommunistisessa sensuurissa valtionvastainen: elokuvaa väitettiin anarkistiseksi ja jopa sen nimi tulkittiin tarkoittavan kommunismia verkossa. Elokuva sallittiin leikkauksien jälkeen, mutta kaikki positiviiset arviot julkisuudessa kiellettiin. Ymmärrettävästi tällä linjalla myös ulkomaanjakelu estettiin. Näistä toimenpiteistä huolimatta elokuvasta tuli supersuosittu, se sai ilmestymisvuonnaan maan parhaan elokuvan palkinnon: siitä tuli uuden aikakauden alku Tsekkoslovakian elokuvassa. Elokuva valmistui varsin vaikeissa oloissa, mikä pakotti ohjaajan ja kuvaajan epätavallisiin, mutta onnistuneiksi osoittautuneisiin ratkaisuihin. Yksi ratkaistavista ongelmista oli kameraa pelkäävien amatöörinäyttelijöiden käyttö: ratkaisuna oli pitäytyä jo 1950-luvulta peräisin oleviin dokumenttielokuvan käytäntöihin ja uusiin teknisiin ratkaisuihin (ns. pitkä optiikka), jotka saavuttivat jalansijaa jatkossa Tsekkoslovakian elokuvassa. Kuvaaja Stanislav Szomolányin ratkaisuna oli pitäytyä mahdollisimman pitkälle ”neutraalissa luonnonvalossa”. Kuvauksen tuloksia on verrattu sävellyksiin ja runouteen, mihin kuvien muotoilu ja leikkisä äänimaailma (mm. hiljaisuuden ja luonnonäänien kontrasti) antoivat tilaa. The Sun in a Net (Slnko v sieti, also translated as Sunshine in a net or Catching the sun in a net) is a 1963 film that became a key film in the development of Slovak and Czechoslovak cinema from the mandated Socialist-Realist filmmaking of the repressive 1950s towards the Czechoslovak / Czech New Wave and socially critical or experimental films of the 1960s marked by a gradual relaxation of communist control. The Sun in a Net received multiple votes in a wide survey of Czech and Slovak film academics and critics in the late 1990s asking them for their lists of the 10 best films in the history of filmmaking in the former Czechoslovakia. Oldrich "Fajolo" Fajták (Marián Bielik), a student who directs quasi-existentialist verbal abuse at his girlfriend Bela Blažejová (Jana Beláková), takes off to a formally volunteer summer work camp at a farm, actually mandated by the authorities, which inspires both him and Bela to start a relationship with someone else. A parallel story peels layers off Bela's permanently tense home life marked by her blind mother's (Eliška Nosáľová) studied helplessness, and her father's (Andrej Vandlík) revealed infidelity and past break with his father (Adam Jančo) who happens to live in the village where Fajolo is finding some consolation in the arms of a fellow student-volunteer Jana (Oľga Šalagová). As Fajolo begins to pry into Bela's grandfather's secrets, she, in turn, allows her new boyfriend Peťo (Ľubo Roman) to read and deride Fajolo's discursive and indirectly remorseful letters from the farm. The solar eclipse barely discerned by the main characters through thick clouds at the beginning of the film is echoed by summer and fall images of the sun as they present themselves to all of them at various points in the film through a fisherman's net from his pontoon on the Danube beyond the city's suburbs, which Fajolo and Peťo have discovered independently and use as a swimming deck, a place to ponder life, or to try to seduce Bela. When, however, Bela brings her mother and brother Milo (Peter Lobotka) to the pontoon after a series of subdued interpersonal crises, the pontoon is on dry land because the water level has dropped, and the film ends with Bela and Milo lying to their mother about what they can see as they did about the visibility of the eclipse during the opening sequences. Uher chose little known actors (Eliška Nosáľová and Andrej Vandlík, both from the SNP Theater in Martin) or non-actors, two of whom had to be dubbed – by Michal Dočolomanský, a student of acting and later a star of Slovak cinema, and by Viliam Polónyi, a professional actor. Only Ľubo Roman, a student of acting at that time, became a successful actor, theater administrator, and ultimately a politician. Jana Beláková from a singer's family had marginal experience from several TV productions and followed her role in The Sun in a Net with a singing career. Štefan Uher (1930, Prievidza − 1993, Bratislava) graduated from the FAMU (Film and TV School of the Academy of Performing Arts) in Prague in 1955. Among his fellow students were future directors Martin Hollý Jr. and Peter Solan who also began to work at the Koliba film studios (then called the Feature Film Studio and the Short Film Studio) in Bratislava after graduation. Uher first worked in the short film division. The Sun in a Net was his second feature film. His first one was We from Study Group 9-A (My z deviatej A, 1962) about the life of a group of 15-year-old students and their school. Uher followed The Sun in a Net by two more films with the same author-screenwriter Alfonz Bednár and cameraman − Stanislav Szomolányi, later professor of cinematography at the University of Performing Arts, Bratislava: The Organ (Organ, 1964), and Three Daughters (Tri dcéry, 1967). The original music score in The Sun in a Net is by the composer Ilja Zeljenka, who also worked with Uher on We from Study Group 9-A, and went on to work with him on six more films. Uher's and Szomolányi's She Grazed Horses on Concrete (Pásla kone na betóne, 1982) has remained one of Slovakia's most popular domestic productions through the 2000s. The screenwriter, Alfonz Bednár (1914, Neporadza − 1989, Bratislava), was already an established writer who published mildly nonconformist fiction somewhat earlier than most other authors. He studied Latin, Slovak, and Czech at universities in Prague and Bratislava. He was also familiar with American and British fiction and had translated Ernest Hemingway, Jack London, Howard Fast, and other authors. Bednár joined the Koliba film studios, Bratislava, in 1960. His first screenplay was The Sun in a Net. He based it on his three short stories "Fajolo’s Contribution" (Fajolov príspevok), "Pontoon Day" (Pontónový deň), and "Golden Gate" (Zlatá brána). A highly likely source of the central theme was the 95% solar eclipse that occurred in Central Europe on Feb. 15, 1961. Additional inspiration for the symbolic construction of the storyline may have come from ancient solar myths that have been available in Europe in increasingly numerous publications since at least 1865. A specific myth of the Sun in a net was brought from Polynesia, more general myths of catching the Sun have been attributed to the pre-Columbian Americas, some of the published solar myths may date back to Indo-European prehistory. Associations with Sol Invictus and other solar myths are possible. The early 1960s saw some relaxation of communism in Czechoslovakia. The Sun in a Net was the first film that took advantage of this new atmosphere. It brought a number of hitherto unacceptable social and political themes: distant — perhaps uncaring — parents, a philandering husband, teenagers changing partners, an attempt at suicide, a poorly run collectivized farm, the fact that the students disdained the summer "voluntary" work camps. None of these issues are resolved in a "positive" manner. The core storyline — the ups and downs in the relationship of two teenagers — the realism and novelty of its urban setting, and the hints at some social and political taboos were not lost on the audience, and cannot have been lost on the censors. The Sun in a Net pushed the envelope and showed artists, and the audience at large, what the authorities could now be pressed to permit. 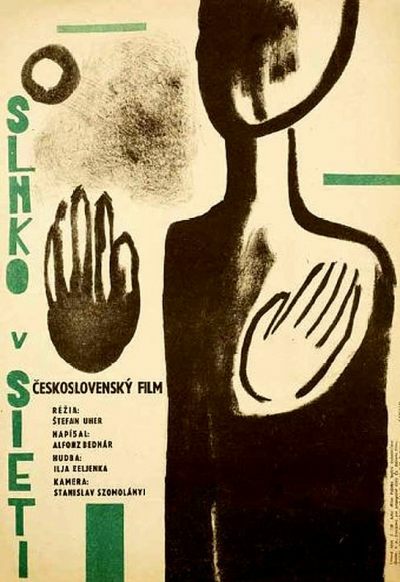 Besides Štefan Uher’s effort to get past the strict requirements of Socialist Realism, the director was inspired by some of the trends current in (Western) European cinema and culture in the 1950s. Among them were traces of Italian neorealism, the film's low-key style, a hint of fashionable existentialism in the dialogues, and attempts at cinéma-vérité amplified in the beer-drinking scenes in a tavern by the employment of a background soundtrack with taped unscripted conversations of real villagers. That also motivated Uher's choice of unconversant actors or non-actors. Some of the film's traits inspired students at the FAMU, who soon followed with a series of films known as the Czechoslovak / Czech New Wave.